LinkedIn has gained an impressive reputation in the world of business and commerce but how can you use it best in order to gain more business? LinkedIn can be a formidable professional networking tool if it is used carefully and given that everyone is able to access a free LinkedIn account, why miss out on the opportunity? Success on LinkedIn is all about successful marketing; successfully marketing yourself and successfully marketing your company. Some would argue that in order to gain any real business benefit from LinkedIn requires upgrading to a paid LinkedIn account. Whilst it is true there are numerous benefits to a paid LinkedIn account, a free LinkedIn account also delivers a phenomenal amount of business value. However, in order to get the most out of you free LinkedIn account you should view it in the same way that you view your other professional related social channels. Essentially, in order to gain benefits from LinkedIn you have to put a level of effort into your presence on the platform. In order to take full advantage of your free LinkedIn account here are two top tips which you should employ at once. The headline which you choose to associate yourself with on LinkedIn is one of the most important features of any LinkedIn profile. Unfortunately the majority of individuals who visit your profile will judge you professionally based on your profile picture and the words you have selected for your headline. 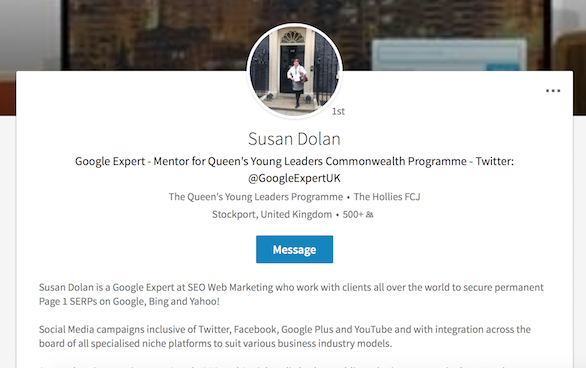 LinkedIn provide users with a total of 120 characters for their profile headline. It is essential to make good use of the majority of these characters if not all. In order to find the relevant keywords for your expertise create a word cloud. In order to create the word cloud take either your LinkedIn profile, resume or job description and see what you notice. Make use of the “|” separator bar between keywords. This makes your headline more visually pleasing whilst also placing greater emphasis on each word. Carefully select either two or three keywords that best surmise your working history and place them in your headline. Tie your headline off with an outcome phrase, for example, “Protecting Clients Financial Services”. Ensure you make use of as many of the 120 characters as you are able to. If you are short of words you could add your Twitter handle. If you work in sales, ensure that your headline contains keywords which will appeal to your target audience. The key is to be creative! It is well worth looking at the “Who’s viewed your profile” stats to see whether changing certain words positively or negatively affects the number of profile views. This is an excellent tool for individuals who work in sales. Essentially Saved Searches sends a list of potential leads directly to your account each week. This feature enables you to reduce your network to a list of people who you would like to prospect. After running a people search, you’ll be able to save that search so you can run it anytime without having to re-enter your criteria. You’ll also receive email alerts on new people that match your saved search. From the People tab on the search results page, select the filters you’d like to apply from the right sidebar. Once you’ve added any filters, click the Create search alert button on the right sidebar. Receive alert – This allows you to select how often you’d like to be notified. Get notified via – This allows to choose whether you want to be notified via email or mobile and desktop. Click Save or Cancel to return to your search results.